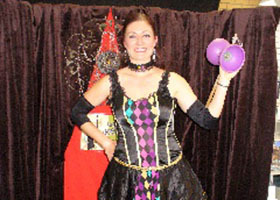 An entertaining show filled with captivating tricks including juggling, circus, unicycle, comical gags, audience participation and so much more. Travel on an expedition with Jesstar, experiencing a race of time whilst discovering the joy of various cultures where Jesstar falls in love and loses the race. She does not win the race but comes to realise through her journey that she has become the star; and therefore does not need to win the race for world success. The audience discovers it’s not just about winning but the experience and wisdom gained in the process and challenges presented in life. Viewers will be dazzled and amazed by Jesstar’s unique talent filling the audience with laughter, joy and amazement all the way. Includes: sound system and music. Includes: seeing coins, flowers, watches and balls disappear. Includes seeing ropes change size, card tricks and rings link together. Includes audience participation. The magician is close up to the audience. Duration: 15 mins to 50 mins. Includes:juggling balls, clubs, rings, spinning carpets, lasso, diabolos, scarves, knives, flower sticks and spinning plates. Includes audience participation. Duration: 5 mins, 15 mins, or 40 mins. Space requirements: 3 x 3 metres, height 4.5 metres approximately. 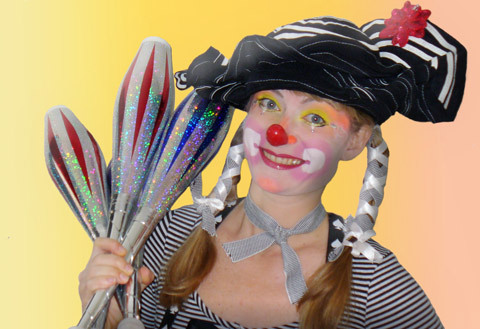 An entertaining and dynamic show of pantomime sketches, which will enthral and enrapture the audience into the world of imagination through gestures, mime, magic, symbols, balloons, surprises and jokes with audience participation. Discover the illusions of the invisible created into reality through pantomime i.e. washing windows, walking up ladders to being stuck in a box with no way out. 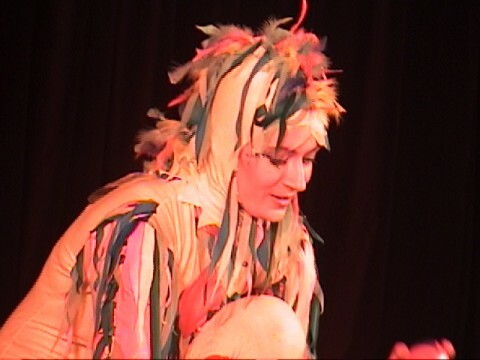 The mime escapes to find an invisible type rope and nearly falls to a tragic death and is saved by an audience member who the mime falls in love with and paints their portrait. The portrait is then framed out of balloons. The mime becomes jealous of the lover who has a girl friend and steals the man away from the woman and asks for his hand in marriage. It is funny, quick witted and amusing to all age groups. 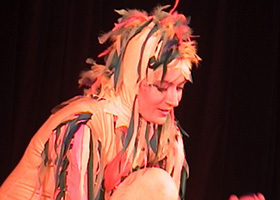 Includes: audience participation and classical pantomime with sound effects and music. Duration: 15 to 40 mins. Recommended for: public or family functions, for all ages. The dance of fire is captivating and entrancing. It is great for out door night shows. 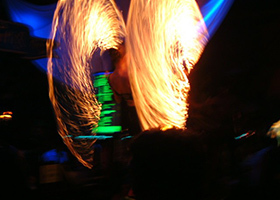 Fire performing is an ancient tradition from Egypt which was used to please the gods and Pharaohs. 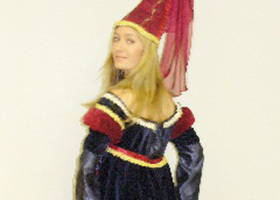 Includes: Fire staff, devil sticks, chains, balls, spinning carpets, diablo, clubs and ropes. Duration: 15 min flashes, with 2 or 3 flash sketches of your choice. Space requirements: 3 x 3 metres approximately. Duration: 15 mins, 30 minutes, or 50 minutes. With a large array of character presentation, the star performer will take audience members on a fairy tale journey through circus and juggling arts. 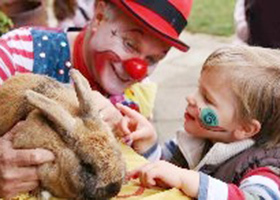 This is an exciting and colourful visual show for children and adults. The show is full of tricks, surprises and emotions to captivate all audiences; and the show also gives a human message. 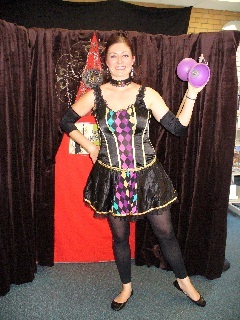 It is in dynamic musical circus style, with various sketches filled with fun and audience participation. Space requirements: depending on floor surfaces and location, an optional unicycle or walking Chinese ball are to be presented in the show. Recommended for: shopping centres, schools, festivals, theatre, private parties, birthdays, corporate events and for companies. 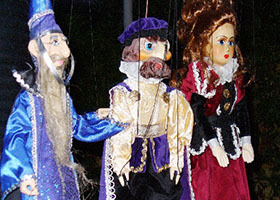 Experience the ancient craft and art of puppets in performance. Short stories and myths are told in the adventures of folk tales that have been passed down from generation to generation. 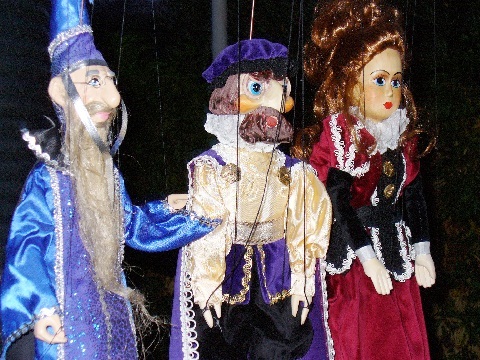 Includes: traditional Czech Republic hand made wooden marionettes. Duration: 20 mins or 40 mins. Teaching tool: further teaching exercises are also available in relation to the stories, if teachers ask in advance. Presenting a family fun filled show. Staring Betsy the Butterfly and Gringo the Grasshopper. 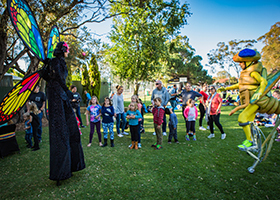 These fantasy creatures will take you on a journey through storytelling, music, juggling, stilt walking the environment and adventure. Captivation and delight will be a surprise for all audience members as these insects are larger than life.